A Hat for Mrs. Goldman – So sweet! My kids love this story of doing something kind for someone even when it’s hard. Bonus: This story also shows kids the power of perseverance and a growth mindset. Enemy Pie – This story sends the message that it’s important to choose kindness, even when you’re dealing with an “enemy.” So clever! The Fox Wish – This one sparked a great discussion about why you might decide to give away something you love, simply to make someone else happy. Leonardo, the Terrible Monster – Another awesome creation from Mo Willems. This picture book shows kids the power of choosing empathy and kindness even when you’re “supposed to” exclude someone. These picture books about kindness show kids that what goes around, comes around. Plant a Kiss – My whole family has this book memorized (even the toddler’s got most of it down). This is a powerful message of putting out kindness into the world and expecting nothing in return. The world lost an amazing gift when author Amy Krouse Rosenthal left us. We Don’t Eat Our Classmates – In this story, a dinosaur starts kindergarten, and she has trouble making friends with her human classmates. Kids just eat this book up. It’s hilarious, plus it delivers a powerful message about treating others how we’d like to be treated in return. The Lion & The Mouse – This wordless interpretation of one of Aesop’s fables introduces the idea of karma and shows why you should treat others how you would expect to be treated. Extra Yarn – This is a quirky, lovely story about what happens when you throw kindness around like confetti. We read this nearly every day! Sidewalk Flowers – Another wordless picture book, this one shows how even the smallest of kindnesses can brighten people’s days. Ivy Loves to Give – Toddlers love this story because sometimes when they try to do what’s “right,” it still ends up being “wrong.” But kindness prevails. If You Plant a Seed – When you share and work together, good things happen. This is an adorable story about the power of an abundance mindset. When teaching kids about the concept of kindness, they’ll learn it much better if you give them real-life, tangible examples of what it means to be kind – which is where these children’s books about kindness shine. Baby Be Kind – This board book is the perfect introduction to kindness for infants and young toddlers because it steps through simple ways to be kind. Peace Is an Offering – This is a lovely collection of ideas for being kind to others and how being kind can bring you peace. Be Kind – My kids loved the pictures of different ways to show kindness. This book gives you a great way to put “kindness” in tangible terms kids can wrap their heads around by showing real-life examples. Come With Me – This simple, sweet text gives lots of kid-friendly examples of how to be kind. Last Stop on Market Street – On the surface, this book is about an ordinary slice of life as a boy and his grandma take the bus together through town. Ultimately, where they’re traveling to delivers a powerful message about choosing kindness, but to me, how the grandma and the boy approach their journey is the bigger message of choosing kindness in those small, everyday moments. So many great conversations with this one! My 10-year-old still loves when I read picture books out loud, but she also devours chapter books any chance she gets. Which means we’ve read a lot of chapter books about kindness too. One of the best ways to raise kind kids according to experts is to talk through ethical dilemmas with your child or ask your child about dilemmas they’ve faced. Children’s books about kindness are a great tool for fostering those conversations, but you can also start powerful conversations about kindness at the dinner table or in the car while driving to school. So I made a free printable version of 40 conversation starters for you to use with your family. 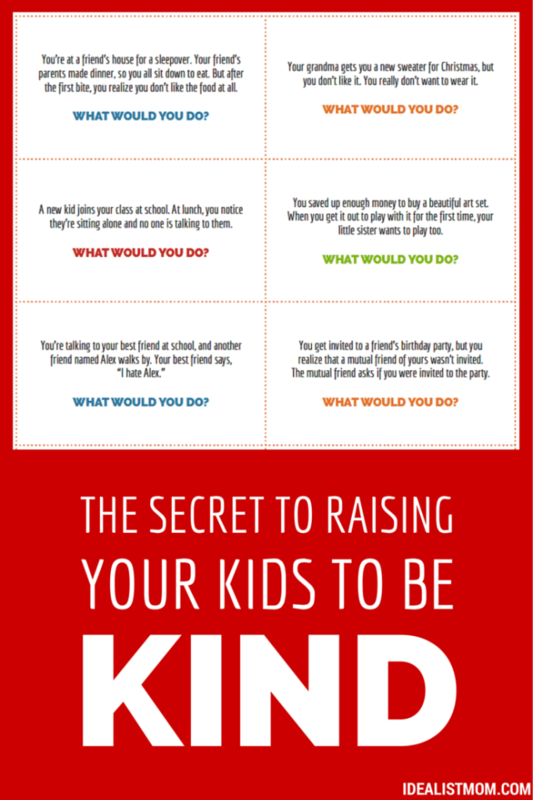 Download and print these “What Would You Do?” cards and then at dinner or in the car, pick a card and ask your kids how they’d handle a situation. You might be surprised by their answers! For tips on keeping these conversations open, friendly, and positive, check out 40 Questions That Will Teach Your Kid to Be Kind to Others. Download the cards. You’ll get the printable, plus join my weekly newsletter! Just click here to download and subscribe. Cut. Or if you’re like me and you can’t cut a straight line to save your life, fold and tear to get a charmingly casual look. Pop the cards into an empty bowl or mason jar, put it on your dining room table, and you’re DONE. What are your favorite books about kindness? Share in a comment below! Thank you for all the time and effort you put into this amazing list. I can’t wait to dig into these with my kids. I don’t recognize a lot of these, but We’re All Wonders is a hands-down favorite of my six year old. So we finally made it through all forty with the exception of one board book I couldn’t get in my library system. Hands down, my favorite was The Girl and the Bicycle. It made me cry and then I found out it made my husband cry, too! That’s a winner!! My five year old repeatedly asked for I Walk With Vanessa. My seven year old loved Enemy Pie. So so many good ones here. I’ve noticed my library picking up several of them after I requested them from other libraries. Your lists are wonderful. Thank you! What an awesome, comprehensive list! I’m a first grade teacher and I am so excited to use this round-up to find new books to share and inspire. Thank you for sharing! This is a great list! Thank you! Do you have any suggestions for books that teach the same messages for older kids (10-12)? Out Of My Mind is an excellent one too. I’m a 4th grade teacher, which are mainly 9-10 year olds, and they love picture books. We actually were trained this summer to read more picture books. I used to only read chapter books and have discovered a whole new way to teach with simple books. Thanks for this list for older kids – I’d love any more suggestions along these lines. My son Loves Wonder and we’re reading Ghost now. It’s a self published work, but Ellie and the Magic Oak is a fantastic middle grades book about kindness, perseverance, healing, and growing healthy relationships. What a great list! I will definitely be choosing books from this list. Jackie, I hope you enjoy them as much as we have! Hi Alicia! Great question. :-) My Amazon links are set up so that when you click them, they will take you to the right version of Amazon (i.e. the UK edition for you), so that would be a fast way to check which ones are available in your area. But I just did a spot check on three of my favorites: Strictly No Elephants, Last Stop on Market Street, and Plant a Kiss — and all three were at Amazon UK. So hopefully that bodes well for the others! This is a great list! I love how you broke them into different aspects of kindness! That can really help with focusing the conversation. I use a number of these in library lessons and with my daughter, but definitely need to add some from here! So glad to hear you found the list useful, Tamra! We love Extra Yarn. We also like Barefoot Books. They have many stories about kindness, empathy, inclusion, diversity, etc. highly recommend them!! Isn’t Extra Yarn awesome?! <3 Thanks for the recommendation, Jennifer! We also love the mitten tree. Thank you for the recommendation, Jeniece! Hi, I just wanted to say thank you for this useful list, I am sure I will find a couple of great options. I find your emails so helpful and I am very grateful for all the tips and information you kindly share. I am the mother of a three and a half year old daughter and a four months old baby girl, constantly looking for information on how to be a better mother and show up for them. You are doing an amazing job, please keep it up! You forgot one! It’s called “Have you filled a bucket today?” It’s a wonderful book! Buying it for my sons classroom too! We love this one too! Makes for great dinner conversations about whose bucket our girls filled today and who filled their bucket, and how. Somethinh Else K. Cave and Ch. Riddel is a very nice book about being different than others and seeing that this can be good and normal. Also love One Smile, A Chance To Shine, Something Beautiful, Sam and the Lucky Money…could go on;) have a whole section of books on making a difference through kindness in my K classroom!! Truly believe in the power of books to change lives!!! “How full is your bucket?” Is another wonderful book. What a way to make a thoughtful and positive impact on our world. I’ve gone through and put the ones I could on hold at our local library. I cannot wait to share them with my boys. Such a wonderful idea! The world definitely needs a lot more kindness and empathy! Thank you!